As the audience enter, Norris is pre-set on stage, frozen in the typical ‘hitchhiker position’ – arm stretched out to one side with his fingers tucked away and thumb pointing hopefully upwards. 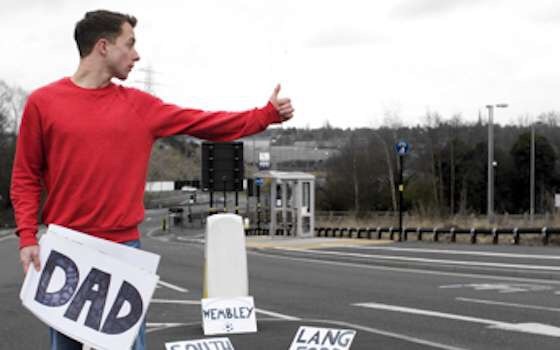 He’s weighed down by a full back-pack and holds a hand-drawn sign, simply stating ‘Wembley’. We are then taken on an hour-long journey (quite literally, a journey) as Norris searches for his father by taking in his Dad’s previous haunts down the M1 before ending up at the prestigious Wembley Stadium, where his Dad can often be found cheering or jeering in the stands. The stage is designed perfectly with small floor lights lined-up in the formation of cats-eyes, as if we’ve been transported to the side of a busy motorway. The Big Belly at the Underbelly Cowgate is an apt setting as its damp smell and sticky heat gets us in the mindset of the dingy service-stations Norris begins to explain. It’s not surprising to find out that Norris won the 2013 Poetry Slam Championship as his script is almost written in verse. Poetic monologues intertwined with minimal props and phenomenal visual animation projected behind him on a large screen, allow the audience to easily follow his story and to feel as if you are taken on his intriguing journey with him. It’s a very descriptive performance from Norris who leaves no detail untold. The many free car journeys he wangled off of complete strangers comes to no surprise as he seems a genuinely nice guy. He’s very likeable and you can’t help but be on his side. He gives you such a deep insight into his private life that it feels as though you’ve been his friend for years. His performance is filled with emotion; from comical audience-participation and hilarious imagery to poignant moments of family loss and heartbreak, you passionately follow his story with strong interest. Polly Tisdall‘s slick direction and Paul McHale‘s glorious editing and animation kindly assists with the storytelling. It’s a shame to hear Norris shouting over the soundtrack at times, which is slightly distracting and unnecessary, so much so that by the end of the piece I am genuinely worried for his vocal chords which are becoming more and more hoarse by the moment. Review written by Ben Thornton.